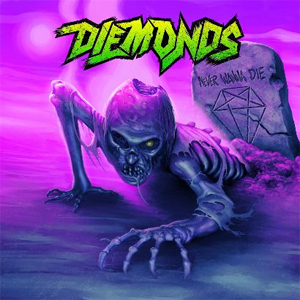 Canadian rockers DIEMONDS have announced that their new album, Never Wanna Die, will be available August 14th. The hard rock outfit locked themselves in the studio with Juno award winning producer Eric Ratz (MONSTER TRUCK, BILLY TALENT) to meticulously craft the follow-up to their debut record, The Bad Pack. The band has most recently licensed a deal with Entertainment One (eOne Music Canada) through Underground Operations for Canadian release and is amped to get back to doing what they do best, hitting the road. They will kick off this cycle by premiering numerous tracks at their Canadian Music Week headline show, Midnight Friday, May 8th at The Hideout, 484 Queen W, Toronto ON. Album pre-sale info is coming soon.